Over the past few years, Yishun has somehow shot to infamy. If people on the Internet are to be believed, the area abounds with cat killers, murderers and even drug dealers. 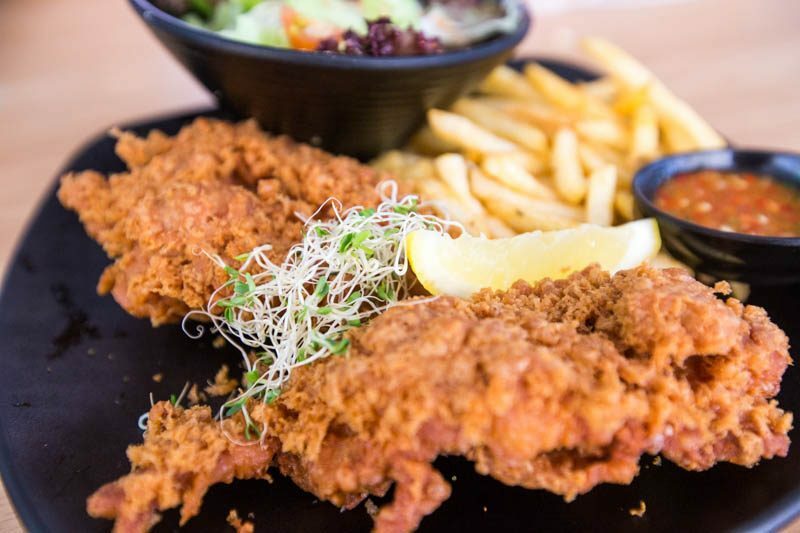 But this is Singapore, and we’re known for our love of good food. So what if you run the risk of running afoul of strange happenings? 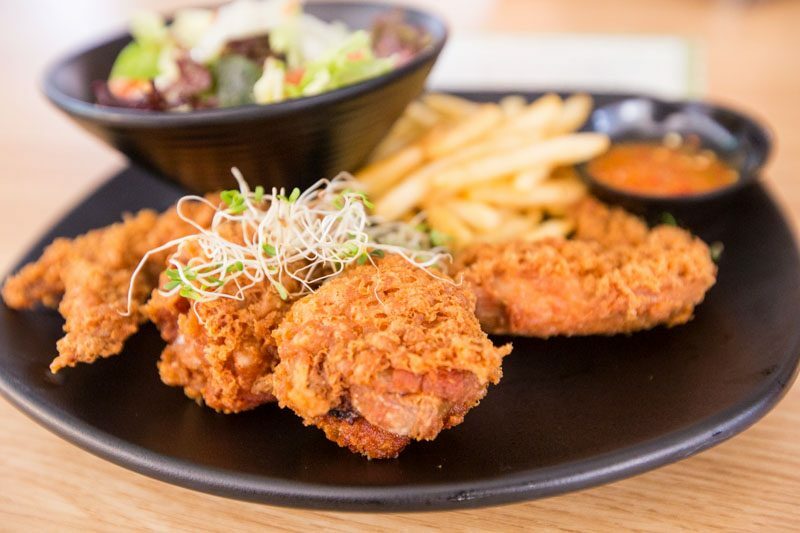 Food is life, and here’s a list of 8 must-try stalls at the newly-opened Yishun Park Hawker Centre. 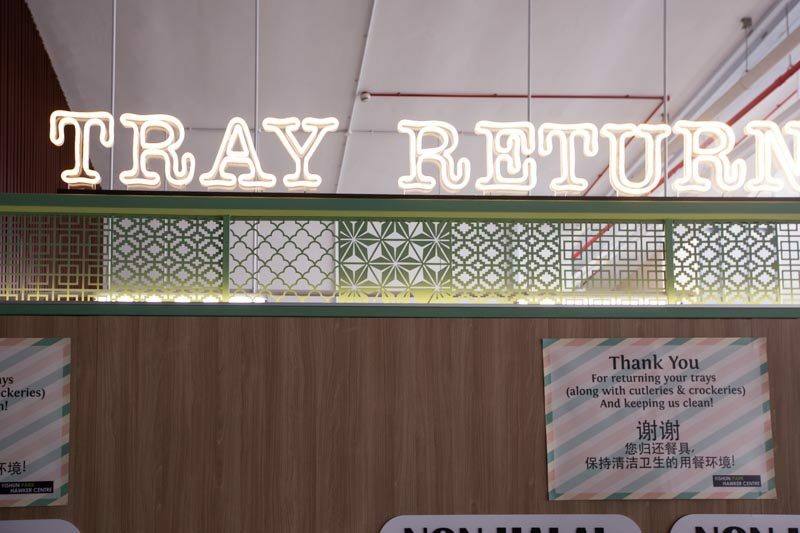 They’ll have you going “shiok ah!” and you’ll forget why you were hesitant to come here in the first place. Think of seafood hor fun, and you probably imagine clear broth and a light seafood dish. 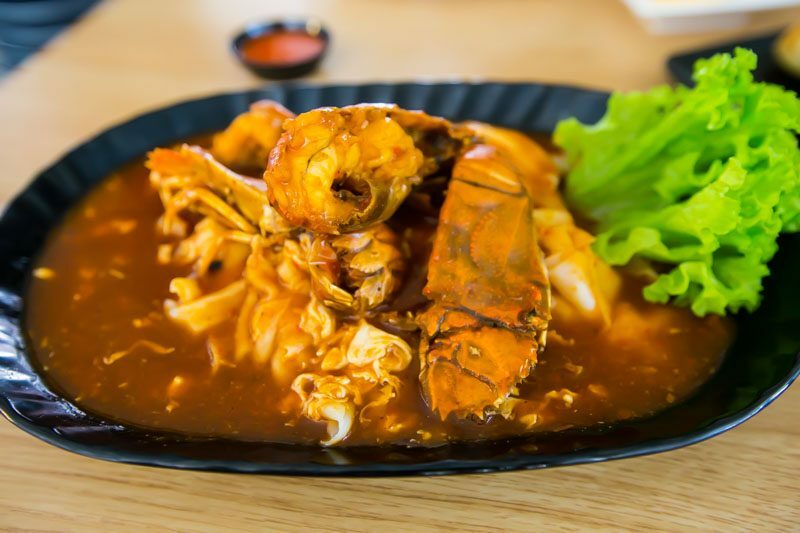 Here at Xin Long Xing, the comforting seafood hor fun gets an upgrade – they offer a Chilli Crab Crayfish Hor Fun that’s bound to excite your senses. Pegged to market prices and the number of crayfish you want in your dish, prices can go up to $20 for a plate. 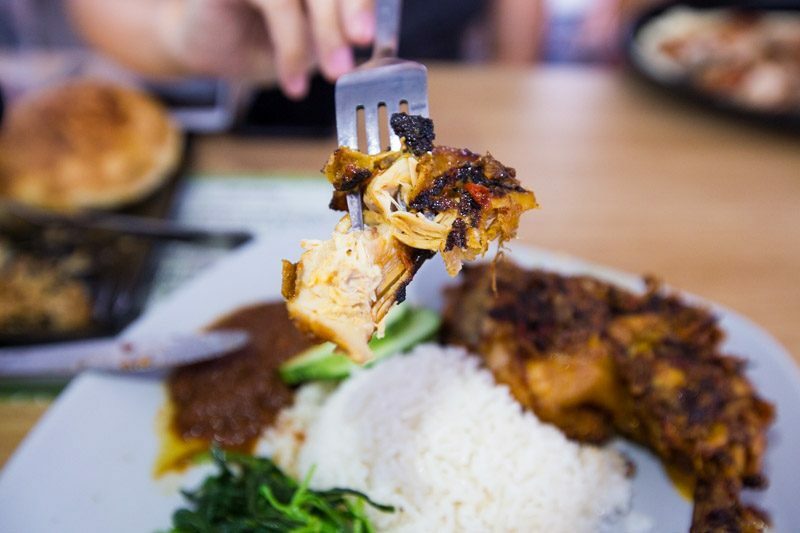 While it seems a tad pricey for hawker fare, you can be assured of the quality. For a plate with two crayfish, we paid $13 for our hor fun. Fresh and juicy, the crayfish slid out of the shell easily. If you’re a fan of hot spices, you’ll want to take full advantage of the sweet chilli sauce that’s served together with the dish. The hor fun sauce itself wasn’t too spicy, especially with the threads of egg white running through it. Spice tolerance levels may differ, so make an estimate based on your own tolerance. With the abundance of seafood in this dish, you’ll definitely get your money’s worth. It’s also a twist on the usual seafood hor fun, so give this a try. 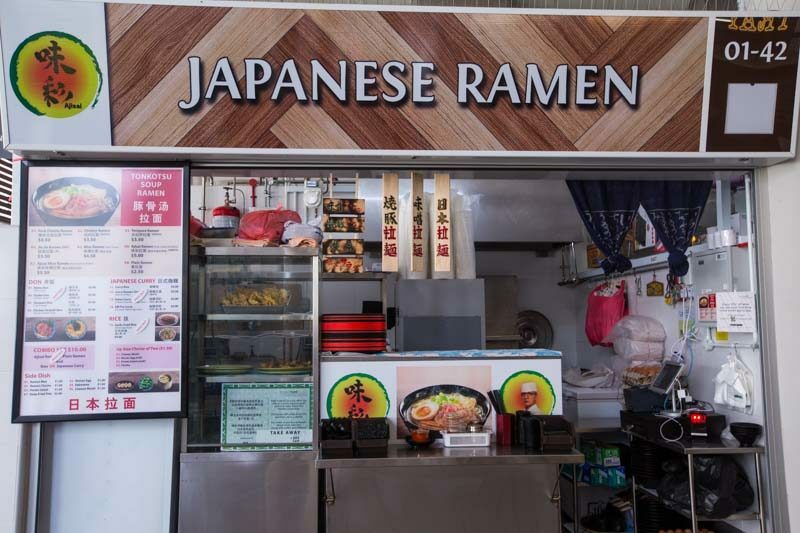 How much was the cheapest bowl of ramen you’ve had in Singapore? $10? Ajisai Japanese Ramen offers a bowl of Pork Cha Shu Ramen for the low, low price of $3.50. 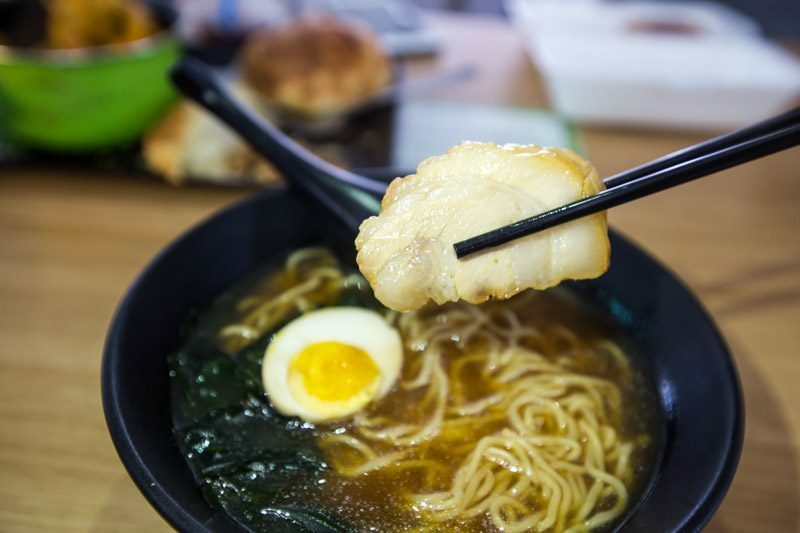 A simple, no-frills bowl of piping hot noodles, this ramen comes with a thick slice of cha shu and a ramen egg. Minimal as it sounds, at $3.50, it’s definitely a steal. Admittedly, the soup flavour could be more complex. Reminiscent of a shoyu soup base, this soup was a little saltier than expected. Nevertheless, it’s still a decent deal. 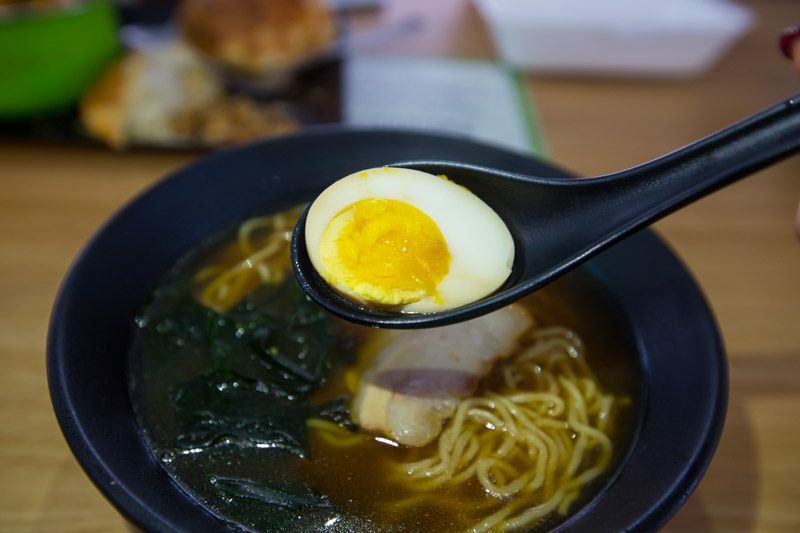 If you’re looking for a quick ramen fix before your next splurge, Ajisai Japanese Ramen has what you’re looking for. 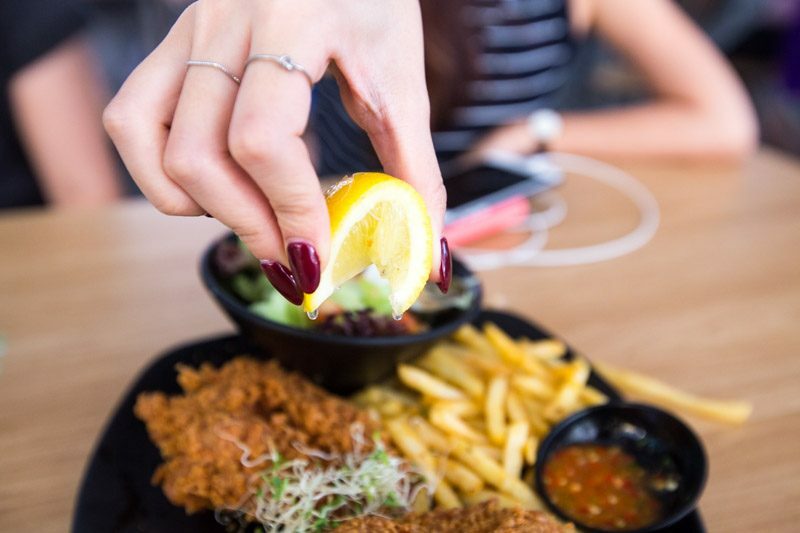 Other quick fixes include Japanese Curry and Don Bowls for less than $5, so it’ll satisfy your Japanese food cravings for now. When it comes to zi char, there’s no dish more iconic than har cheong gai, or prawn paste chicken wings. 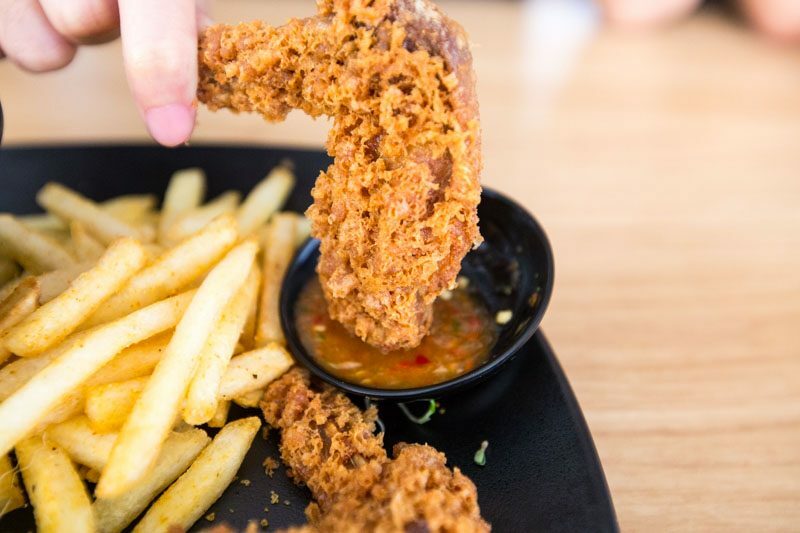 The siblings behind Ah Tan Wings brought us piping hot chicken wings that are an instant hit. Highly popular, Ah Tan Wings is worth the wait. The shrimp paste wings ($5.50) were incredibly crispy. Each bite resulted in such a satisfying crunch that you can’t help but chow down on the plate of wings. The shrimp paste flavour was so strong that it permeated the whole wing. Marinated for two days in the har cheong gai paste, it’s no wonder that the flavour seeps into the meat too. Despite the crispy crust, the chicken meat was still really succulent. The juices just burst in my mouth when I sank my teeth into it. I also tried the Ah Tan atas cutlet ($7), which is chicken cutlet marinated with shrimp paste. Like the wings, this cutlet was also super crispy. It came with a lemon wedge that you could squeeze over it, cutting through the rich har cheong gai taste. All the sets came with a seaweed salad and shaker fries. Drizzled with miso dressing, the seaweed salad really helped to undercut that unhealthy feeling of indulging in too much fried food. The skinny fries also added some carbs to a meat-heavy meal; I especially enjoyed dipping them in the chilli sauce. 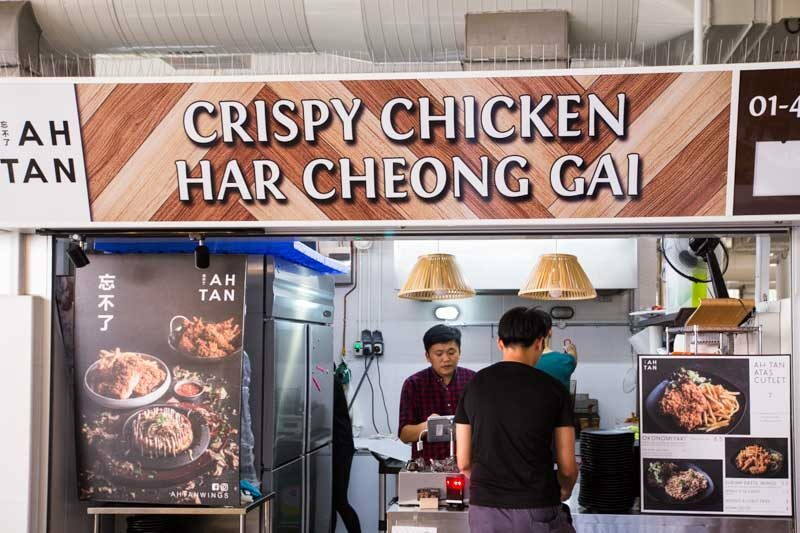 Highly satisfying, Ah Tan Wings is a stall you can visit when you’re craving for har cheong gai but don’t have enough people to share from a zi char stall. A traditional Chinese pancake dessert, min jiang kueh is the childhood favourite of many Singaporeans. Fluffy and moist on the inside, yet with a crispy outer crust, this simple pancake usually comes in flavours, such as peanut or red bean. At Munchi, tradition meets innovation. 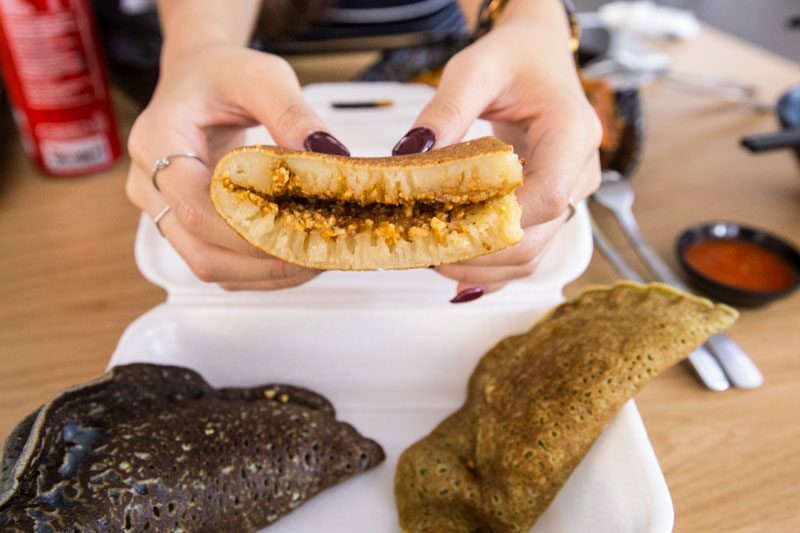 I tried the Peanut Traditional Pancake ($1.20), and it was everything I expected. Homely and comforting, biting into the fluffy pancake brought back memories of family dinners at hawker centres and desserts for sharing. The grainy peanut filling also complemented the spongy honeycomb texture of the min jiang kueh. Nutty and sweet, this is the authentic taste of the past. Of course, new flavours abound at Munchi. If you’re a durian lover, you’ll want to munch on their Mao Shan Wang Durian Munchi Pancake ($2.80). 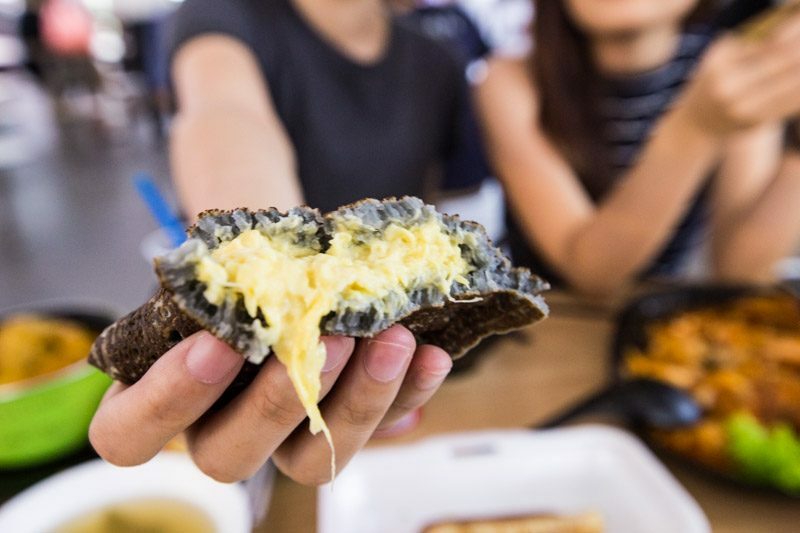 I tried it with the charcoal skin, another innovative twist on the traditional kueh. Oozing with fragrant durian goodness, the creamy texture of the durian paste within the pancake makes this variant super worth the price. Where else can you get a taste Mao Shan Wang durian for $2.80? Another interesting flavour combination is the Cream Cheese Munchi Pancake ($2.80). I tried this one with the green tea skin. Although the slightly sweet cream cheese flavour was quite prominent, the green tea flavour of the skin was very subtle. If you’re getting this flavour, I would recommend sharing because it can get quite jelak halfway through. 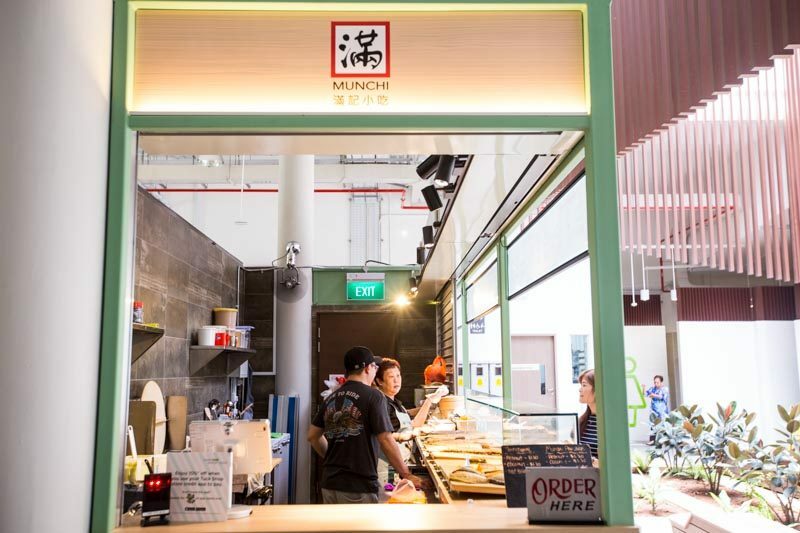 Bringing together the old and the new, Munchi is definitely where you’ll go to get your min jiang kueh fix after a good meal in the hawker centre. If you’ve ever had to get a small child to eat their greens, you’ll know what an impossible task that is. But bring your recalcitrant kid down to Yummy Salad House, and you just might be able to change their minds. 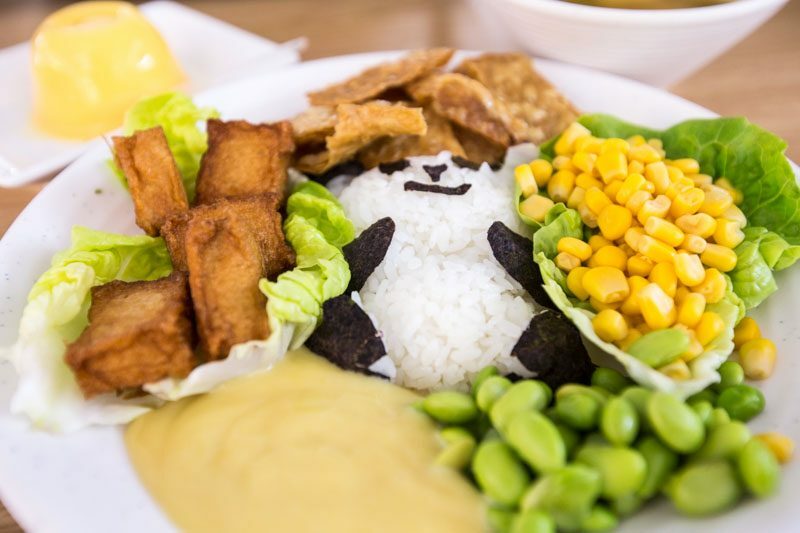 Order the Happy Panda Set ($8.50), and choose the ingredients that go into the salad. I picked corn, edamame beans, fried bean curd skin, and mock fishcake. I especially enjoyed the fried bean curd skin; I couldn’t stop myself from picking up the pieces to crunch on. 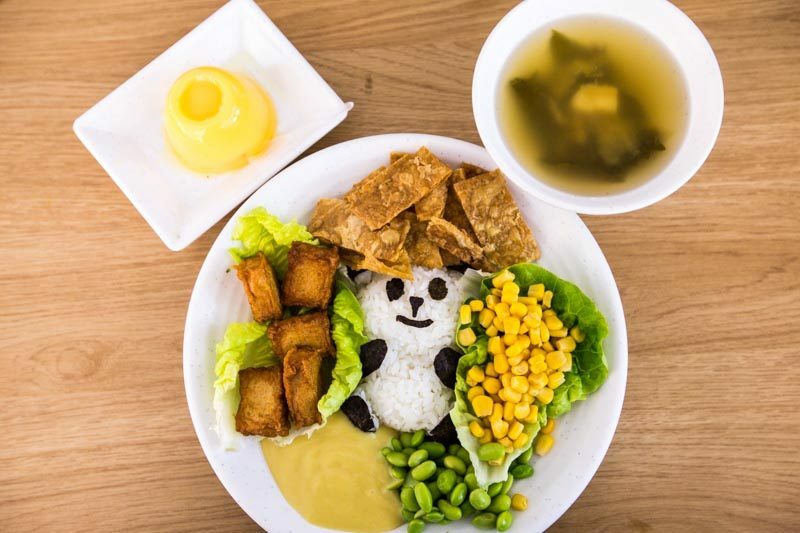 Parents with young children can get them to try the salad by virtue of the adorable rice panda. Individually handcrafted at the start of the day, these pandas are made of rice and seaweed. A perfect carbs base that complemented the other ingredients well. The meal also comes with soup and mango pudding, for those who want something beyond a simple salad. 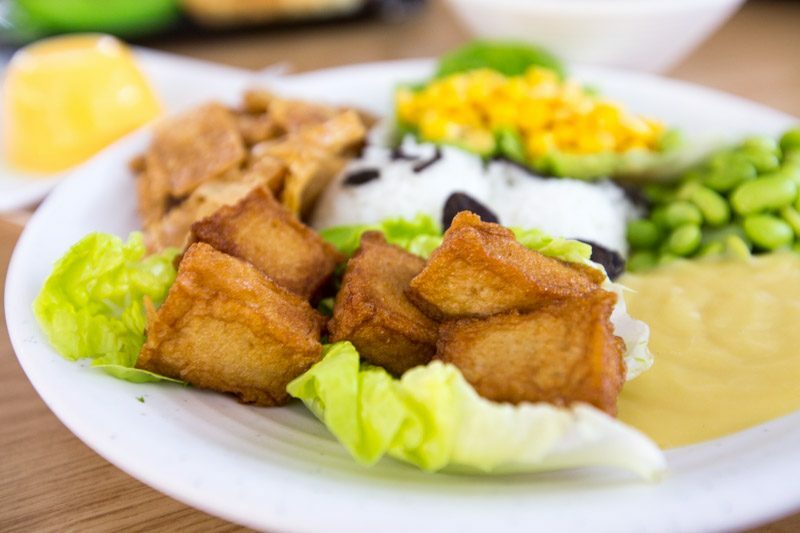 With an innovative and eye-catching presentation, the vegetarian salads from Yummy Salad House could just change your kid’s mind about eating their greens. 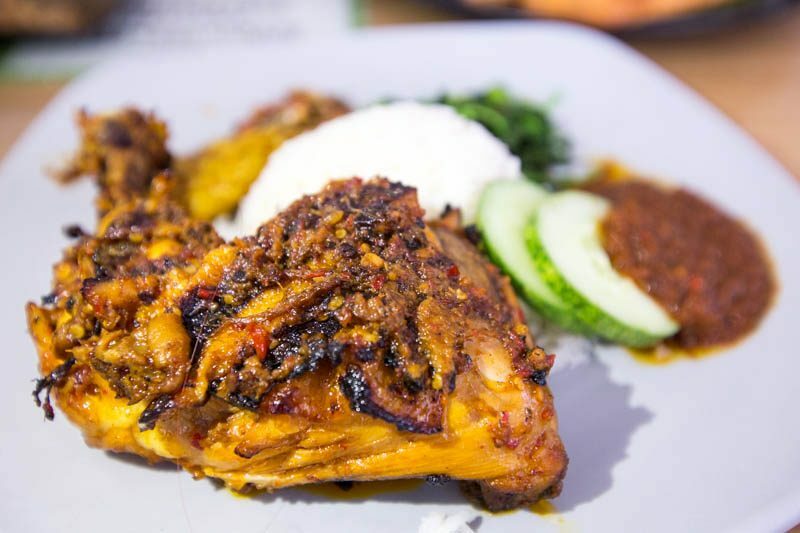 When you put two beloved dishes together, you just might get a winning combination like Nasi Lemak Ayam Taliwang. 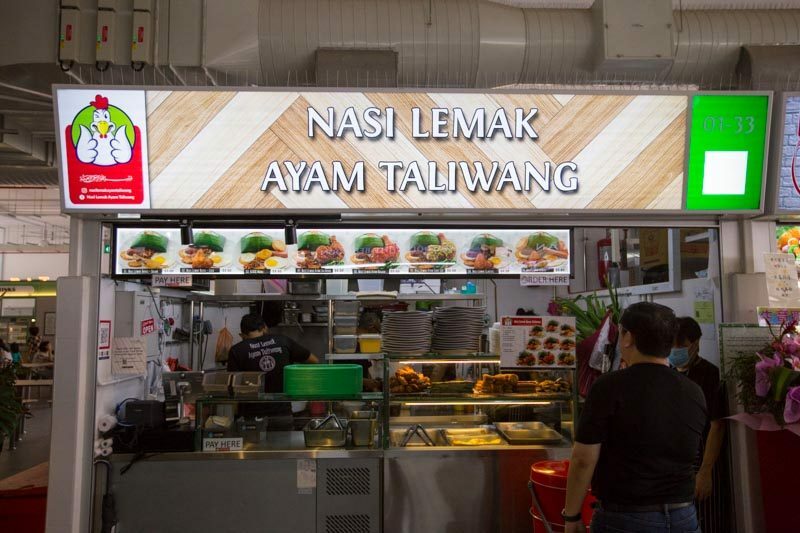 A blend of Malay nasi lemak and the Indonesian ayam taliwang, the Nasi Lemak Ayam Taliwang ($5.50) has the fragrance of lemak rice together with the unique spice mix of ayam taliwang. Served in a rather large portion, the spices atop the chicken were glistening with oil (and the promise of heat in my mouth). I liked how the sambal that came with the dish wasn’t too spicy, so I could really appreciate the mix of flavours. Sweet and spicy with the slightest hint of shrimp flavour, the sambal paste added a much-needed bite to the dish. Although the top layer of the chicken was incredibly flavourful, the spices were not fully infused into the chicken meat. Which was a pity, because I can imagine a proper seasoning of the chicken would result in spicy mouthfuls bursting with flavour and juice. The rice was fragrant enough that my mouth started watering just from the smell of it, though it was a tad too salty for my liking. It could be just a couple of hiccups because they were quite busy when I was there. If I’m ever in the area again, I’d come back to give it another try. 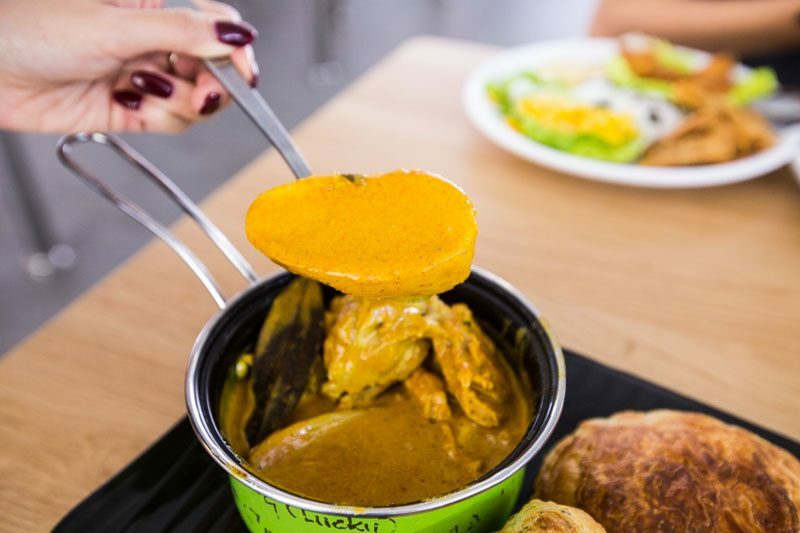 Whether you take your prata plain, with curry or with sugar, it’s definitely a Singaporean favourite. 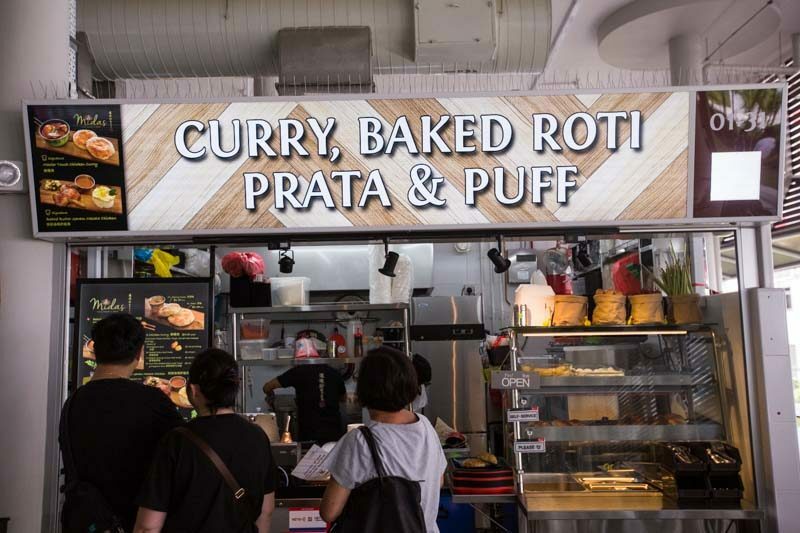 Baked prata extraordinaire Midas has opened another outlet at Yishun Park Hawker Centre, so that those on the North-South line can also enjoy our perennial favourite, but with fewer calories. 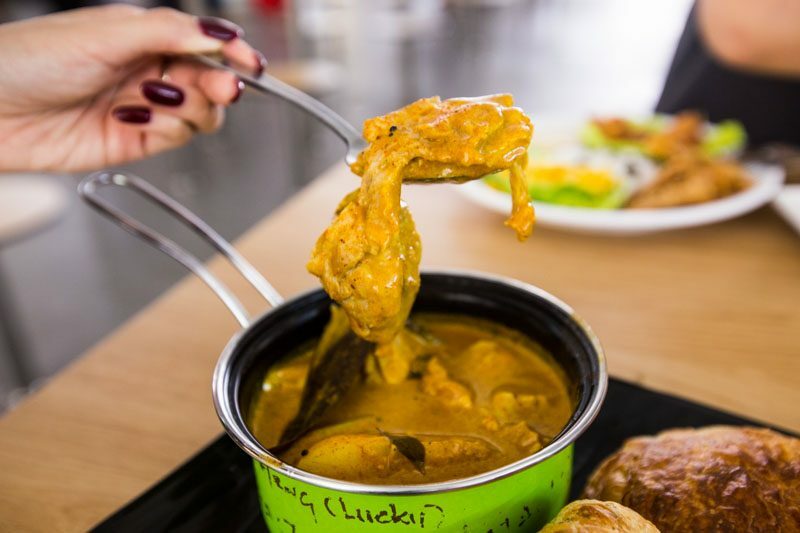 I’m a prata-with-curry person, so I went with the Signature Master Touch Chicken Curry ($5). I also got one Baked Plain Roti Prata ($1), and one Baked Spring Onion Roti Prata ($1.50). 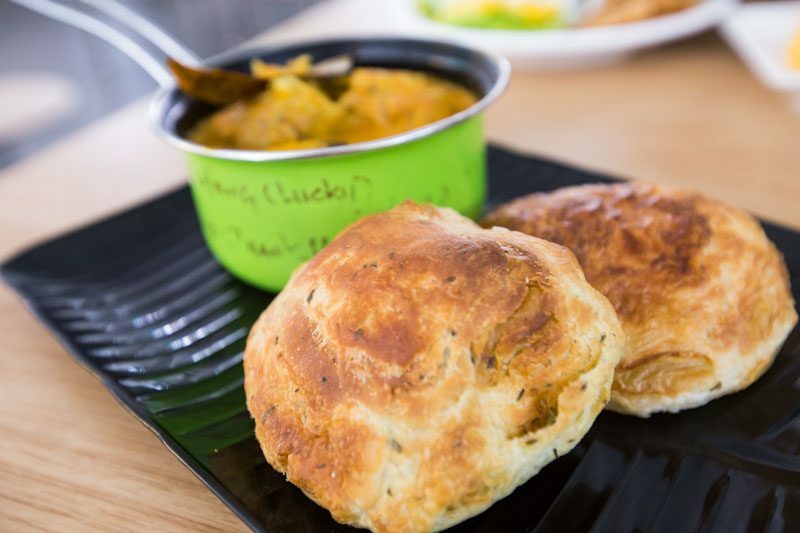 Baked fresh every day, the difference between this baked version and the regular pan-fried pratas is palpable. It’s definitely a lot less oily than normal pratas, which bodes well for those of us who just can’t seem to stop ourselves from chowing down on these sinful discs of oily goodness. 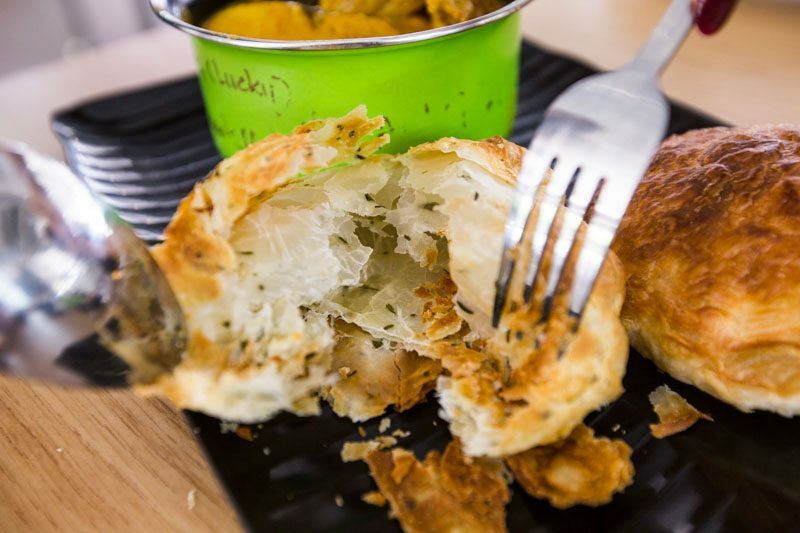 Golden-brown and crisped to perfection, the baked prata is super flaky as well. Airy and light, it is much less jelak than the regular pratas. Terrible for my diet, really, because it just means I can stuff more into my belly. I really enjoyed the chicken curry and how it lingered on my tongue. Unlike some curries which burn your tongue to the point of numbness, this curry is spicy but not to the point of setting your mouth on fire. The chicken pieces were also well-infused with the curry flavour, and juicy too. The chicken curry came with large chunks of potato, which I loved. Potatoes are one of my favourite carbs, after all. However, this potato was a little too hard for me — I prefer the potatoes in my curry to be mushier. If you’re a prata fan, but want to cut down on the calories, drop by Midas for a prata-fix that won’t leave you feeling guilty. 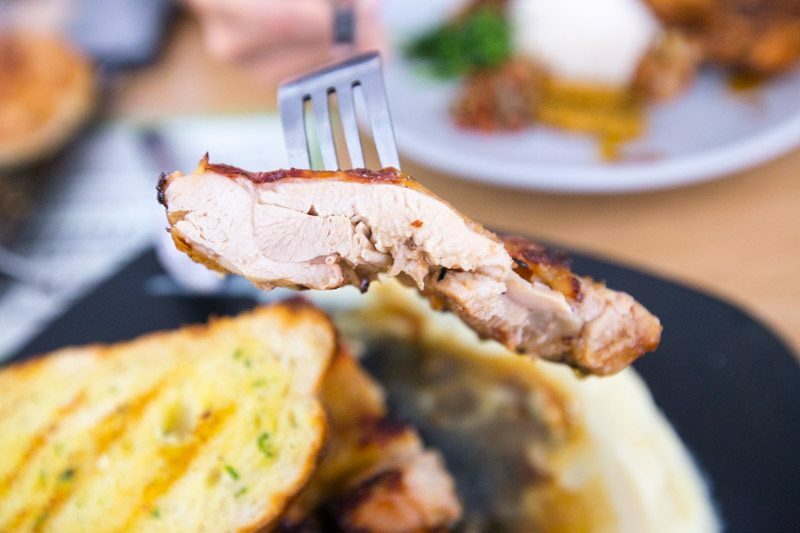 When you order barbequed chicken, you’ll expect it to have the charred taste from, well, barbequing. And that’s exactly what Smokin’ Joe Western BBQ promises, and delivers. 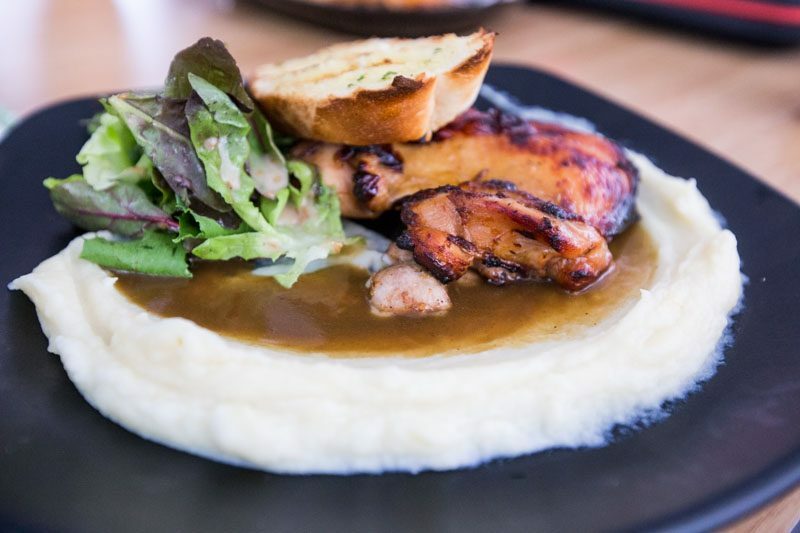 Served with an artful spread of mashed potato, the BBQ Boneless Chicken Leg ($7) is exactly what you’d expect. Succulent and smoky, the lingering flavour clings to your tongue even as you polish off the sizeable portion. Tender chicken thigh meat is accompanied by the creamy rich mashed potato. Mingled with the special brown sauce, a spoonful of mashed potato just slides smoothly down your throat. I quite liked the underlying charred flavour in the chicken; it really added to the authenticity of the barbequed food. 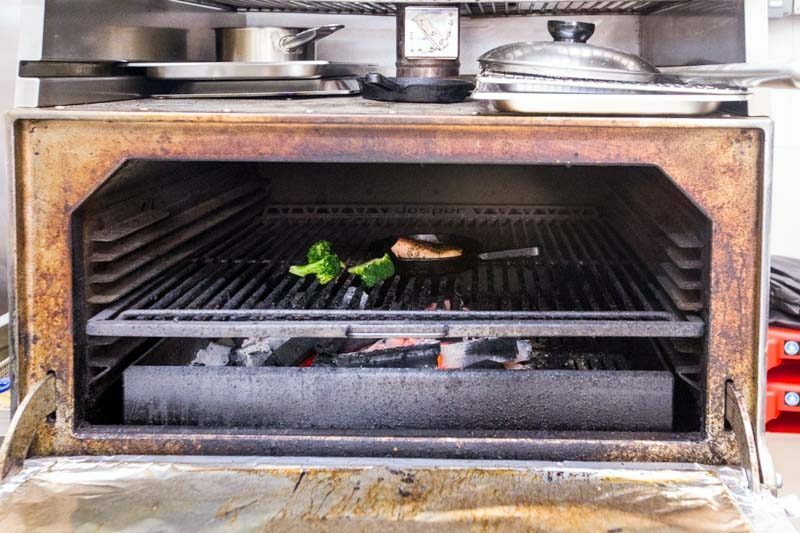 And the smoky rustic flavours arise from the cooking method: using 100% charcoal, the meats are cooked in a Josper charcoal grill and oven. Talk about back to basics! 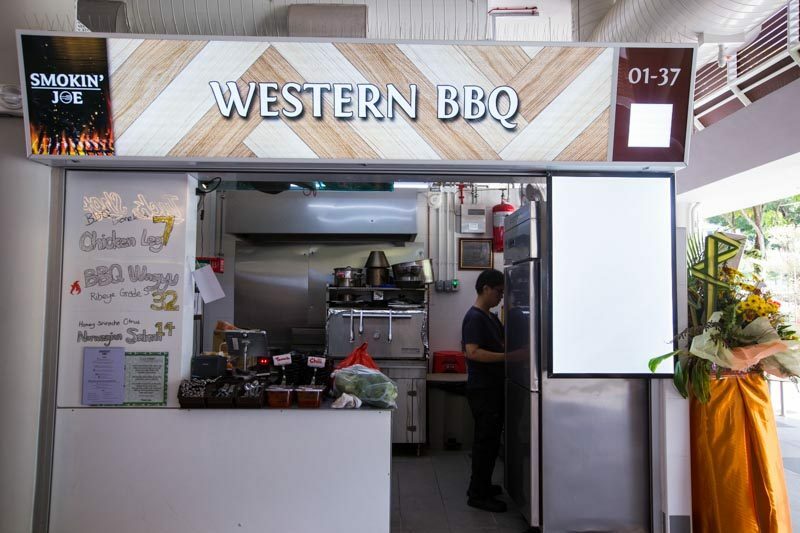 Smokin’ Joe Western BBQ brings a taste of yard barbeques to Singapore, with the acclaimed Josper grill and oven. Give them a try, if you like your meat smoky and your mashed potato thick and creamy. 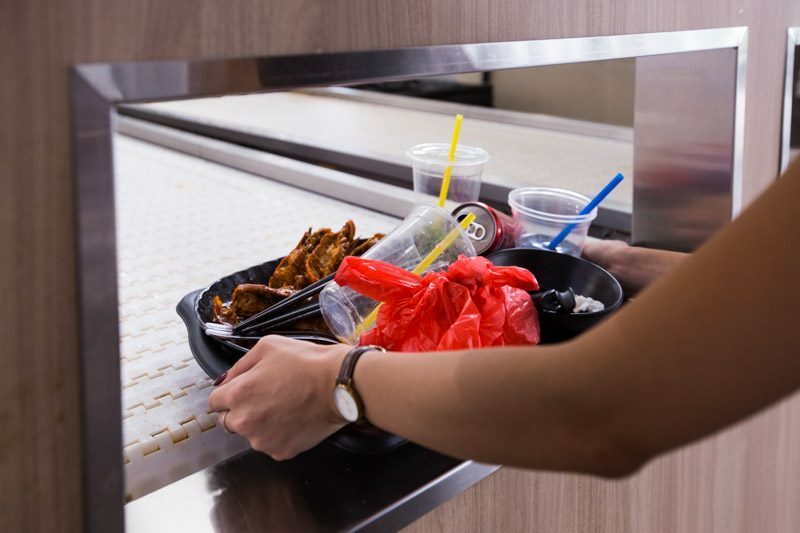 Don’t forget to return your trays before you leave the food centre because you’ll get your $0.50 deposit back. Yes, that’s why the food prices are all a little more than what’s on the menu. Just pop it on the conveyor belt, and you can retrieve your 50 cent coin. 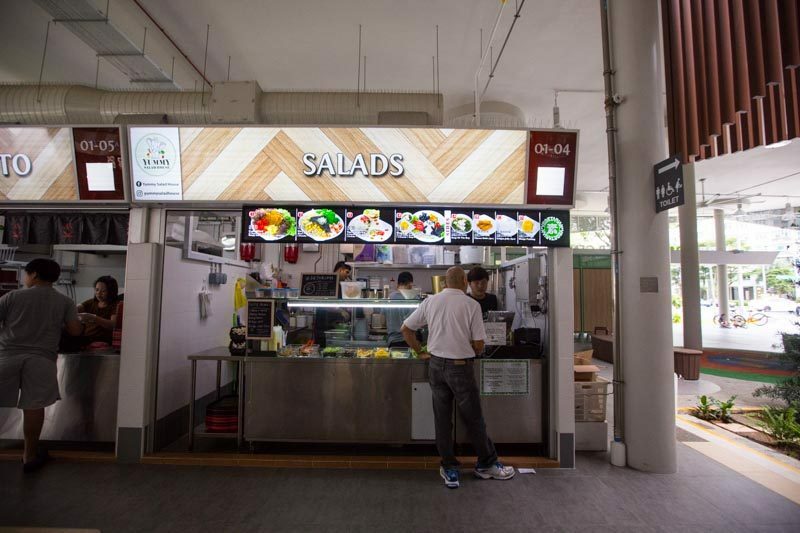 If you live in the area or happen to be around, pop by Yishun Park Hawker Centre for a diverse dining experience.